Straight off the bat I can say that the most anticipated Korean blockbuster of 2011, aside from Christmas’ war epic My Way from Jang Je-gyu, is easily the worst film I’ve seen all year, no matter how you look at it. It’s very easy to see what went wrong, one bad decision was made after another, with barely any right ones in between. What is not so easy to understand is how things went wrong. Though I would not label Sector 7’s filmmakers as the cream of the crop, they normally seem to know what they’re doing and consistently deliver solid, if overly sentimental fare. They are endowed with a keen ability to whet Korea’s insatiable appetite for melodrama. Curiously, there is little to no melodrama in Sector 7. It hints at it a few times but seems to abandon it in favor of concocting a copycat medley of rehashed Hollywood plot devices and production techniques. It is truly a triumph of expectation over delivery as I cannot imagine any producer seeing a cut of this expensive bomb and proclaiming “We have a hit on our hands!” The film’s pre-release exposure was enormous, everyone (at least in Korea and on the internet) knew about it being the first Korean 3D IMAX film, numerous posters and trailers were available, and the entertainment rags were all talking up Ha Ji-won’s arduous workout regimen. When the day came, it opened very strong before the poisonous word of mouth pulled it right back out of theaters within weeks. Clearly it was the intent of Yoon Je-kyoon (producer/writer) and Kim Ji-hoon (director) to copy every similar film that had met with a lot of success in the hope that their synthetic product would also be a big hit. 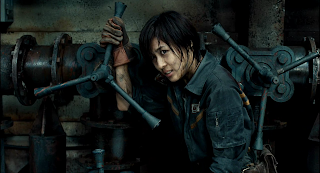 Ha Ji-won is basically an Ellen Ripley (Sigourney Weaver’s iconic character in the Alien franchsie) stand-in, the oil rig is from Armageddon (1998), a major character’s death and resurrection is lifted from the first Lord of the Rings, the genesis of the monster is not dissimilar to Korea’s own The Host (2006), and the list goes on. In fact, the film is a veritable cornucopia of metanarratives. Curiously, aside from lifting all of its plot elements, characters, set-pieces, and effects from other movies, it also has a link to the popular K-Drama Secret Garden (2010) which ends with Ha Ji-won’s stuntwoman character being given the script of Sector 7. Clever synergy? I suppose so. Even stranger is that her characters in both the show and the film are identical. Women that are physically strong but emotionally weak and incapable of making decisions. Stranger still is that her tragically deceased father is incarnated by Jeong In-gi in both. Everything about Sector 7 is constructed, even the sets aren’t real as most of it was shot on green screen. As a result it barely feels like a film and the chief cause of this is just how badly it is made. What is it that can make a film go oh so wrong? B-movies, as I’ve explored in my I Am a Dad review, benefit from lowered expectations. Conversely, when you suffocate the nation’s media outlets for a month, touting your bigger-than-anything-you’ve-ever-seen-before-it blockbuster, you suffer from heightened expectations. When you go down the latter route but produce a film on par (or below, as is the case) with the former course, you’re left with a big problem that is pretty much irreparable. You’ve promised something spectacular and eventful but have completely failed to deliver. Worse than a bad filmmaker, this makes you a liar. More than anything else, and there’s a lot, two things bothered me the most about Sector 7. 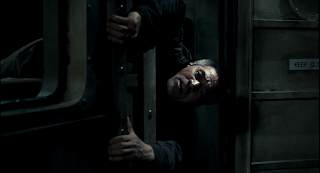 One is the incomprehensibly bad rear-projection technique used in the bike sequences, of which there are four… on an oil rig. The quality is what you would expect from the 30s or 40s not 2011, worse still is watching Ha Ji-won madly rev the bike and swoop down to her left and right sides, she actually looks like a little 6-year-old boy pretending to ride in a Grand Prix. 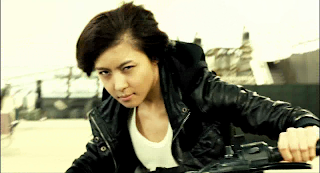 Yoon, who also produced this summer’s Quick, seems to have a bike fetish. The second, and perhaps more upsetting point, is the film’s latent mysoginy. Hae-joon embodies both male and female traits, the problem is that the male traits are the hero ones, and the female traits are all ugly stereotypes. 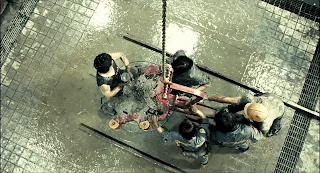 Additionally, for a film that attempts to make Ha Ji-won a consummate action star by pitting her as a conquering heroine against a vicious antagonist, the heroics are mostly reserved for the men. Throughout the film, they are repeatedly sacrificing themselves, one of the characters does so twice! Another does so to save his friend, in what I’m assuming is supposed to be an emotional scene (no such luck). After he does so, his friend remains rooted to the spot, whimpering, not trying to escape and is then quickly impaled. In more able hands this might have been a clever send-up but no such attempt is made here, which begs the question, what was the point?